Welcome to the soft launch of Sundays. Sorry if things appear to be bare bones right now. As I type this, I’m still in the process of tweaking things on this site (and learning wordpress as I go along). The goal is to always have new content every week till the end of time or the internet. Mostly all by me but there will be a handful of stories that were collaborations with writers. If things go well, one of the longer stories might run twice a week. I’m kicking things off with an unorthodox full preview of the featured story from Calumet vol. 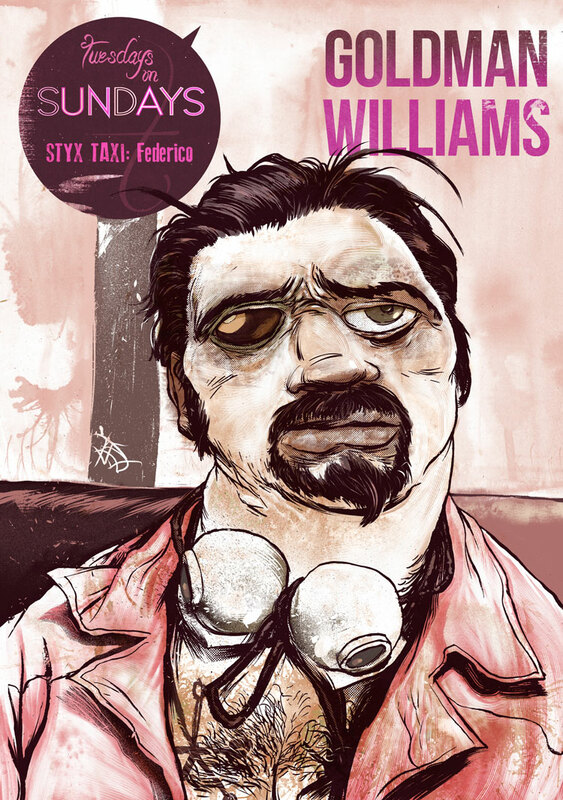 1- STYX TAXI: Federico. Yup, I’m running the entire story here. This story originally ran on the Chemistry Set site. (RIP) Written by *Steven Goldman with the art chores by me. If you like it enough to own a print copy, please do check out my Etsy. Calumet vol. 1 collects this along with a couple of shorts. *spoilers: the entire story is up on Steven’s site too.